However, this recipe is so easy even I can do it. In fact I make a batch of ice cream two or three times a week. It takes five minutes to mix and about 15 minutes to freeze. 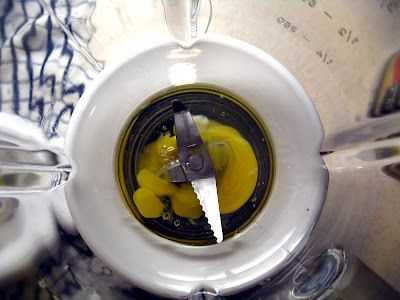 Whiz the egg in a blender until fluffy. Add the sugar and whiz again. Add the milk and vanilla and whiz for about a minute. Pour the mix into an ice cream maker. 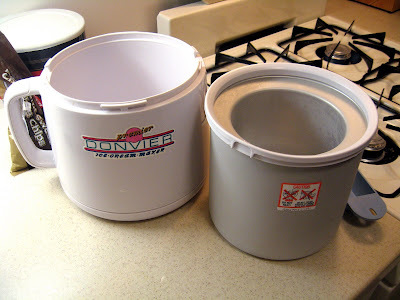 We have a basic one with a cannister that stays in the freezer and an easy hand crank. (Found it at thrift store for $8 last year. Have made approximately $2,000 worth of ice cream in it already.) You turn the crank once every few minutes, and the ice cream is done in about 15 minutes. 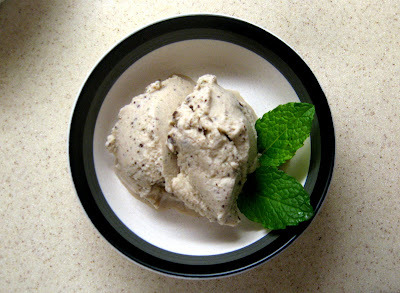 For variety, you can add fresh mint during the blending phase and chocolate chips after the ice cream is almost frozen. We just tested out our new ice cream maker the other day. It's great! We wanted to try making some mint flavored ice cream with mint from the garden. Can you really just add in the leaves or should you simmer them in the milk then let it cool? I just dropped it in with the sugar. 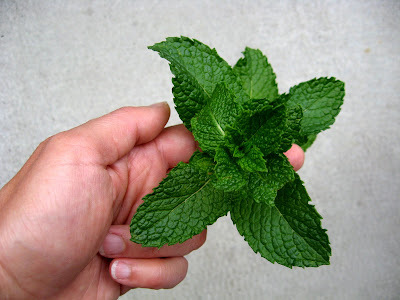 It makes kind of a mojito-y mint julep-y fresh mint taste. But it's a little different than store-bought mint taste. I liked it but Tom was not crazy about it. That, and I desperately want an ice cream maker now! Now that's my kind of recipe - 4 ingredients! I don't have an ice cream maker though. Maybe it's time to get one? P.S. 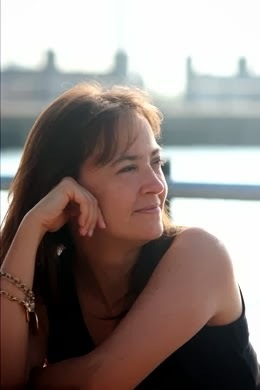 I wanted to thank you for the link love and to let you know that my blog has moved. I've also added you to my blogroll. :) Thanks again! Thanks for the link to Bromeliad. I like your new spot. Nice header, too. Would zis be Paree, mon amie? mint chocolate chip ice cream is one of my very favorite flavors, but i've never had it homemade. that needs to change asap.